I had my first sheesha in 2000, a few days after moving to the Middle East. This was before the Hookah Craze took America’s cities, and later its suburban cul-de-sacs, by storm. Dubai in August. At nightfall it was still a balmy 115 Fahrenheit. My sweat was drinking Gatorade and toweling off. A new colleague took me to dinner and, afterward, a sheesha café. I consulted the menu and ordered cappuccino-flavoured tobacco. A few minutes later, a befezzed gentleman in white robe and red vest brought over two water pipes, set them at our feet. He took both wooden pipes in his mouth—without inserting plastic, sanitary mouth-tips—and inhaled furiously. The charcoal began burning orange and, after 10 or 12 deep inhalations, smoke was coming out of his nose and mouth like a car with a busted radiator. I calculated how many times a night the sheesha sommelier did this, and worried about his life expectancy. I had a puff. Nice. It really did taste like cappuccino. My colleague enjoyed a raspberry-vanilla. This was relaxing, fun, cosmopolitan. I was urbane and sophisticated. I could acclimate to any culture in the world. I was a traveller, not a tourist. I was swimming in a pool of my own sweat. By week’s end I had my own pipe. I was an expert. I’d lived through the Cigar Bar phenomenon of the ’90s and now I was an early adopter of the sheesha. I was cool. I smoked every day. I was basically a local. They would probably offer me citizenship. What I didn’t know was that only fools and suckers smoked flavoured sheesha. For an 11-year-old it was acceptable, but not for a real man. I was a sheesha wimp, a hookah neophyte. I learned this a few months later from Ahmed, an Egyptian friend. “Which tobacco are you wanting?” the waiter asked. “Okay. Fine.” He shrugged. When the waiter returned, he called the pipe a hubbly-bubbly. For some reason, I found this troubling. A small part of me—my intellect—must have known what was coming. He smiled. I had a few more hits. If there’s one thing people like to do in the Emirates, it’s this: sit around and do nothing. Well, almost nothing. Coffee shops, cafés and sheesha joints are ubiquitous. Find a sheesha café with a majlis. This is an Arabic word for “sitting place” and refers to an area for welcoming guests. A traditional majlis will have cushions—usually in a red, white and black striped pattern, from Bedouin culture—on the floor or on a raised platform. The majlis is often inside a tent. This is the perfect atmosphere for enjoying a sheesha, socializing and tasting local food. Try Arabic coffee from a dallah—an ornate samovar with a long beak, brewed over an open fire. The coffee isn’t very strong but it’s seasoned with cardamom and sometimes ginger, rosewater or saffron. There are hundreds of chic, upscale hookah bars in Dubai. You can enjoy a smoke from a skyscraper on Sheikh Zayed Road with stunning views of the city, smog and construction dust. Instead of this, try a working-class café in Karama. Aside from the labour camps, this is the most densely populated part of Dubai. It’s also one of the oldest and most genuine. Dubai can feel like Disneyland, if less authentic and less intellectual, but if you escape from the five-star hotels to walk through the streets where hard-working immigrants live, you’ll have a more engaging, substantial experience. You’ll also get a feel for what the city was like before oil was discovered and the people became overnight petro-sultans. If you’re in Al Ain—the “garden city” beloved by Sheikh Zayed, father of the UAE—try the Mercure Grand, a hotel perched atop Jebel Hafeet, often incorrectly cited as the country’s tallest mountain. (That would be Jebel Jais, in Ras al Khaimah.) The mountain rises from the centre of Green Mubazzarah, a park that includes an oasis, hot springs and lake. The drive up Jebel Hafeet can be terrifying, given its steepness, lack of adequate guardrails and impatient drivers. If you make it up alive, enjoy a luxury swimming pool, sheesha, cocktails and the view—falcons flying overhead, mountain goats clinging to the jagged cliffside, the city of Al Ain sleeping at your feet. You’ll find that Oman, bordering the UAE to the East, has a more tranquil vibe. The landscape may look the same, the locals dress very similar and—like everywhere in the Gulf—labourers from South Asia and the Philippines do the heavy lifting. Beneath the surface, however, the two nations are quite different. Oman is slightly cooler in temperature, and much more chill. Omanis are extremely friendly, kind and open, quick to help strangers and meet new people. They’re not as wealthy as Emiratis and seem to enjoy life much more. The country isn’t as opulent, fast-paced or detached from reality. Muscat, the capital, is a five-hour drive from Dubai, through the Hajar Mountains. You can easily secure a visa at the border crossing. There isn’t much to see on the drive: a few old forts, camel farms, the odd cafeteria or gas station. Once you get to Muscat, walk around in the city centre. Ramble through the winding streets. There are more than 100 sheesha cafés, so you’ll stumble on one. If you want, ask a local for a recommendation. He’ll—if you’re a man, ask a man; women should ask women—be happy to offer advice and probably even take you there himself. Oman has recently instituted tighter restrictions on sheesha, so cafés must now be 200 metres away from residential areas, mosques, schools, health and government buildings. Only hotels with at least three stars can offer sheesha, and the space must be indoors and properly ventilated. They also regulate the tobacco and the coal used to light the pipe. Minor annoyances perhaps, but ultimately this means the experience will be healthier and safer. If you find yourself in Rabat, there’s a small chance you’ll get bored. The capital city isn’t nearly as intriguing as, say, Fez or Tangiers. But there is one certified gem: the Kasbah des Oudaias. Built in the 12th century during the Almohad caliphate, today the kasbah is a dense, winding, intricate network of alleyways and tightly clustered buildings. It’s not a historical artifact so much as a living body that evolves every year. Combining ancient structures, chic new cafés, a museum, hammam, 2,000 residents, shops, gardens and a glorious 12th-century mosque, the kasbah is a place to explore for hours. Go early so you’ll have time to get lost and find yourself again. Take the Rue Jamaa past the mosque. Here you’ll find a wide platform with an impressive view of the Bou Reg Estuary and Atlantic Ocean. 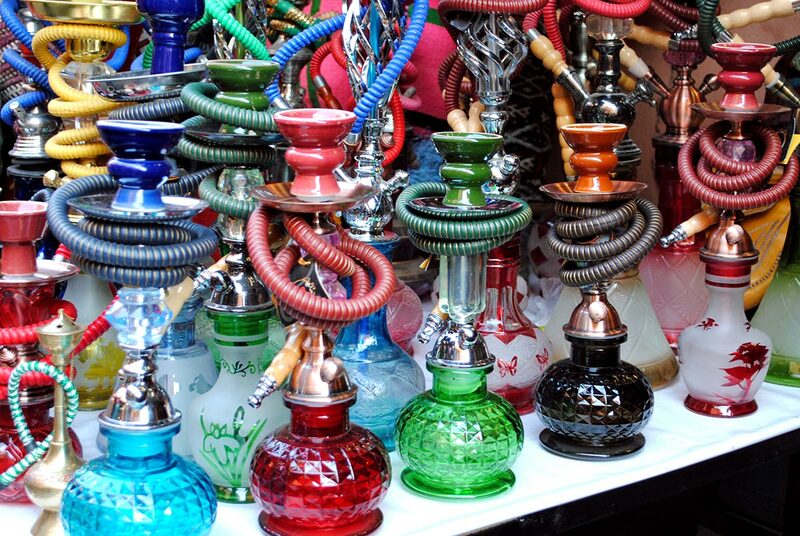 Find the closest sheesha café—there are several within spitting distance—have a seat and enjoy a smoke. This is an ancient place, so keep it very real. Play backgammon and order hot mint tea. (Somehow, hot drinks are supposed to counteract the heat.) Your tea will be served with what appears to be an entire mint shrub stuffed inside the glass. The locals will be happy to talk to you in Arabic, French, English, Berber or an uneasy hybrid of them all, but don’t be surprised if they try to sell you carpets or authentic Moroccan trinkets—just don’t follow them somewhere to see very special items at the best-best price. That never ends well. Like Oman, Egypt has been cracking down on smoking, especially in public spaces. But don’t worry—the country still has plenty of hookah joints. One of the best is the Naguib Mahfouz Café, a traditional Egyptian eatery in the Khan el-Khalili bazaar, part of the al-Gamaleya district of the old city. Take time to wander through the surrounding area. Al-Azhar, one of the world’s premier parks, is nearby, as is the beautiful al-Hussein Mosque. The bazaar—or souq—itself is dense, lavish and enchanting. The bazaar was originally the burial ground of the Fatimid caliphs over 1,000 years ago. The mausoleum was situated within the Fatimid’s Great Eastern Palace, which began construction in 970 under the guidance of Gawhar al-Siqilli, a general who founded Cairo in 970. The souq is a great place to try Egyptian street food, sip Arabic coffee or forage through shops that sell jewelry, antiques and trinkets. Khan el-Khalili is popular with both locals and tourists. Artisans are still hard at work—the goldsmiths have their own souq. The Naguib Mahfouz Café is named after the country’s foremost novelist, who lived in the district. Why not buy one of his books—he’s a Nobel winner, after all—while you’re there and read it on the very streets where it was written? Open the novel, puff on a relaxing sheesha, and have something to eat. I recommend their delicious Umm Ali—a sort of Egyptian bread pudding and the national dessert. I may have been a naïve fool back in 2000 (how smart could one be, before smartphones? ), but I lived in the Emirates for 10 years, travelled extensively in the region and smoked a lot of sheesha. Here’s what I’ve learned: take it slow and enjoy your leisure. There’s enough rushing around in life. When you smoke, take plenty of breaks and drink lots of water. Between the heat, the walking and the hubbly-bubbly, it’s easy to get lightheaded. You don’t want to end up like me with my first Egyptian sheesha—green and nauseated like a young man drinking his first beer. Andrew lives in Washington, DC, where he's a freelance writer and editor. He previously worked in Tokyo, the UK, Abu Dhabi, South Korea, New York, Dubai and Okinawa. He spends his time traveling, drinking espresso and collecting records.